« News Feed Optimization (NFO) is the new SEO! No this isn’t a scam or a trick to get you to buy one of my books (but please don’t let that stop you from doing so). This is a really basic technique that a number of Fan pages are still missing out on and that is … make sure your landing page for first time visitors of your page is a welcome tab that consists of a nice big arrow pointing to the like button. Bingo that’s it! There are a few best practices that Dennis shared with me on this tab feature as well and that is … the size and color of the arrow matter! The bigger the better to be sure to get your point across as to what you want the first time visitor to do which is click on the like button. And the color Red or Orange are the best colors to use for the arrow – because they visually arresting and hard to ignore. Some great examples for you to look at that take this idea to the next level are 1800Flowers and JC Penney. The 1800Flowers page was running a special discount that you could get and immediately use once you like the page (called the Reveal tab – because once you liked the page it revealed the discount code for you to use on your next order). Great idea – technically a little tricky for the average person to pull off but very easy to implement down stream since they already use discount codes in their shopping cart. JC Penny the same sort of idea with their new ecommerce page. Wanna go shopping on JC Penny – like are page to get started. Sort of a Reveal tab in a sense but note you don’t have to Like to shop on their page. I know I know these are B2C examples but you know some savvy B2B marketers are thinking about how to implement a reveal tab too! What can you give away that you can use for a really smart welcome tab or reveal tab? 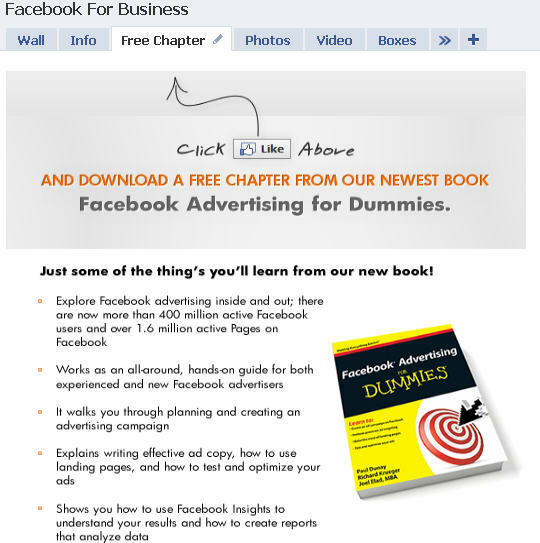 FYI – Facebook Marketing for Dummies (Wiley) the 2nd edition is about to come out early next year – special hat tip to my co-author (and college buddy who reconnected with me after many years on Facebook!) Rich Krueger for carrying a great majority of the work load on rewrite of this book – I wish I was as good a writer as Rich is!